November 2, 2015 | 3 p.m.
Bethel’s second-ever ROAR Day took place on October 13. 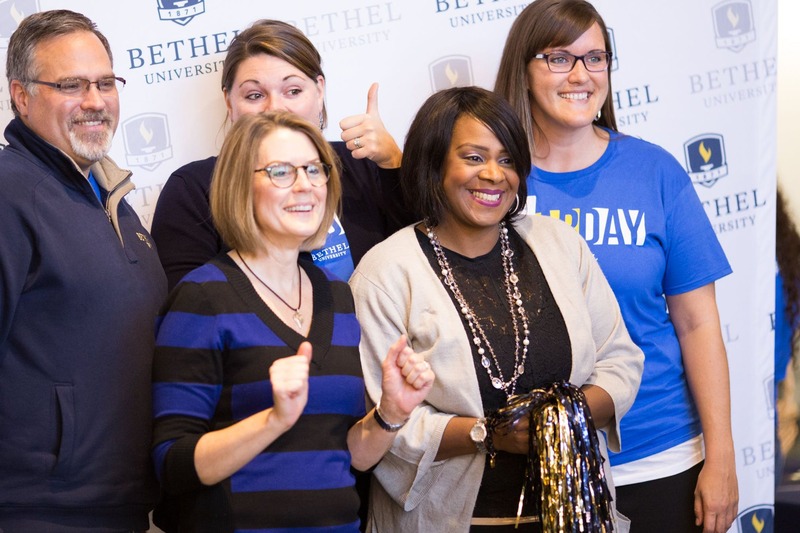 With a focus on social media and online giving, the Bethel community took to social media to tell the world about their experience at Bethel—and why they choose to give back on #BURoarDay. “We need to own our identity as a school. Whether you’re a freshman from Woodbury, a seminarian from San Diego, or an MBA student taking classes after work…we are all Royals,” says Chad Boysen, director of the annual fund and alumni participation, and part of the team that came up with the idea for ROAR (Raise Our Alumni Rate) Day. The Alumni Participation Rate (APR)—or the percentage of alumni that give back each year—is a common benchmark used in higher education to gauge the satisfaction of alumni. Bethel’s APR—which was 9.75% last year—impacts the funding that Bethel receives from national granting agencies. ROAR Day is designed to help “get out the ROAR” and engage the masses of donors who might not give on their own. Human Resources and University Advancement representatives handed out free coffee to employees and invited them to participate in raffles for Bethel gear and gift certificates. Meanwhile, student alumni group Royal Legacy hosted a photo booth, gave out treats, and engaged students in the conversation about how their education is funded and the role they could play in passing on the favor to future Royals. The group educates students and alumni year-round in a fun and engaging way, staffing the call center and hosting events like the Royal Run 5K, a birthday party for Bethel’s founder John Alexis Edgren, and A Royal Thank You. Like ROAR Day, these initiatives are all intended to celebrate Bethel and the role donors play in its success as a non-profit organization. The momentum built in recent years by Royal Legacy was evident in the make-up of ROAR Day donors. Very recent graduating classes—and even current students—made up several of the top giving classes by percentage of gifts. The classes of 2004, 2013, 2010, 2006, and 2012 topped the charts on ROAR Day. 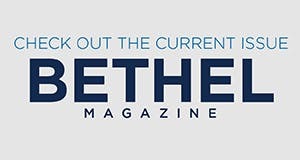 The numbers illustrate not only increased involvement in giving by students and young alumni, but an interest in giving via social media and online avenues that focus on a public relationship with Bethel and celebration of their alma mater. “Bethel is a place that prepares men and women to go out and lead people, programs, and organizations that have Kingdom impact. We’re not competing with other wonderful non-profits or the local church for financial gifts. It’s not an ‘either/or’ question; it’s an ‘and.’ We complement one another,” says Boysen. He also noted that ROAR Day offers a unique opportunity for students and alumni in all of Bethel’s programs and locations to tell the stories of how Bethel has equipped them for ministry and life, and to give back together. Check out the ROAR Day news feed or view an alumni-created video starring some favorite Bethel personalities. ROAR Day 2016 is planned for October 11.